Thoughtfully assembled...Exudes a quirky warmth. Packs enough drama, music and history to fuel a miniseries...Thoroughly entertaining. A real crowd-pleaser...Superb historical footage and rare music clips. Likely to thrill devotees as it hips new audiences...The film stands as a reminder of how much it can mean just to listen. Cogent and compelling as a pop-culture history lesson, and genuinely uplifting. A gift to anyone interested in our musical roots. A deeply satisfying traditional doc about deeply satisfying traditional music that balances reverence and dramatic edge. For anyone with even a passing interest in pop music, Harrington's richly textured doc is a treasure of folkloric Americana. Illuminating history lesson...with clever animation and engaging interviews. Beth Harrington's lovely documentary...doubles as a history of the spread of folk music. Equal parts musical entertainment and emotional human experience. Honest and heartfelt as a country song. A handsome and nigh-faultless history of [an] iconic roots dynasty...that'll have country and roots music fans salivating. Will take you on a marvelous meandering journey through American musical history that you will never forget. A loving and comprehensive tribute to the timeless music of this musical dynasty. A must-see for anyone interested in American roots and folk music. Includes some knockout musical performances...that are worth the price of admission alone. Rich with legends from the mountains of Virginia and beyond. A well made, informative, emotional documentary. It's the story of a family hanging together over nearly a century, and of a specific strain of popular music that runs through America like no other. Harrington reaffirms her status as one of our most worthy musical film directors. The history is surprising and fascinating. The film is rich in fresh detail and insights. By the time we lift the needle off the 78 player and head for home, we're quite in love with Maybelle and the Carter clan. A must-see for roots music enthusiasts. An apt and wonderful tribute to the Carter-Cash musicians, their devotion to family, and their contributions to American music. An affectionate and often compelling tribute that's accessible to both longtime fans and newcomers alike. Brings warmth and depth...that helps you appreciate the classic songs even more. A documentary clearly forged from the love of its subject. If you think country & western amounts to little more than a guy or gal in a cowboy hat warbling about a truck, all it will take is a couple of minutes of the Carters' raw energy to set the record straight. For lovers of country and roots music this is a film not to be missed. A real treat...skillfully interweaves archival photography and recordings with animation. The film's level of detail is uncommon and hearing it all in the voices of the original trio's surviving descendants, along with archival recordings of Maybelle and Sara, is thrilling. An incredible story that strikes at the heart of country music and its preservation. Crafted like a great country song, full of love, heartbreak, triumph, loss and redemption. Simply put, it is the greatest documentary about musicians I have ever seen. A loving, musical look at the path carved by the family, whose music influenced a young Johnny Cash. A long-term labor of love, the film will be of interest to anyone with even a passing interest in country music. Not only a fascinating historical excavation of a family's enormous contribution to American music, The Winding Stream is also visually stunning. The family's contribution to country, folk, and roots music is vast. This is a story for the ages. 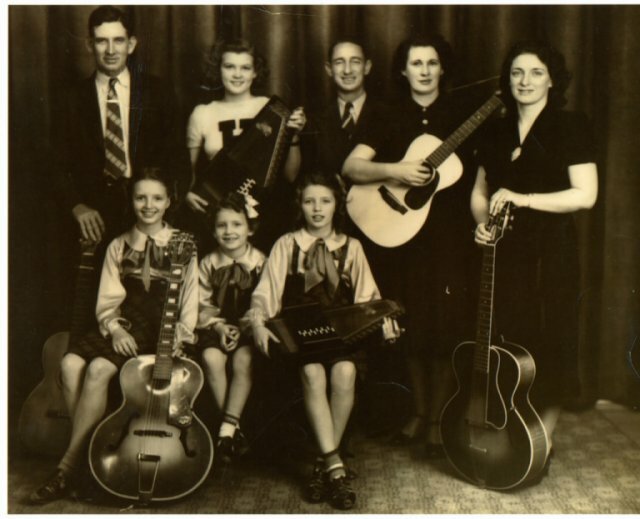 A fascinating look at one family's experience at the heart of what we now call country music. The first non-fiction feature to offer a definitive look into the history, legacy and ongoing worldwide influence of Virginia's famed Carter Family.